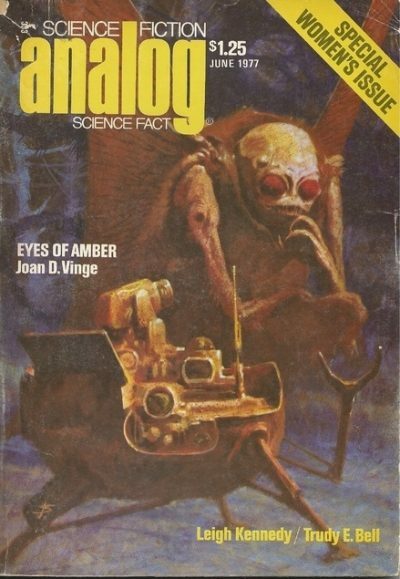 I have excoriated Ben Bova’s fiction in the past, but I have nothing but admiration for his work as editor for Analog. While Disco-Era Analog might seem a bit stodgy to modern eyes, at the time Bova was a breath of fresh air. Rather than settle for being a second-rate Campbell, he did his best to be a first-rate Bova. He recruited new authors, many of whom differed (excitingly) from Analog’s Old Guard. He also bought more stories by women than did his predecessor1. While some old guard objected to Bova’s direction, enough readers enjoyed it to give him a remarkable six Best Editor Hugo Awards, as well as one nomination for the same category. It seems unlikely Campbell would have had a Special Women’s Issue. Bova did: Analog, June 1977. Rapoport conveys her profound frustration with space colony advocates who steadfastly refuse to consider human factors like governance. When the would-be architects of space habitats do deign to take note of such issues, they prefer shiny tech-based solutions and do not consider whether such solutions would work as intended. This is James’ Complete Lack of Surprise. I noticed something similar in a Co-Evolution Quarterly colloquium on space colonies: any issue not involving rivets was assumed to be trivial to solve. I was a bit surprised that she had to deal with Dean Drive fans. I don’t know why, given that the same guy who wrote The Third Industrial Revolution also wrote articles about the Dean Drive. The discovery of an intelligent race on Titan provided a much-needed a revenue stream for a cash-strapped space program on Earth. Political intrigue on Titan presents the humans on Earth with a moral decision: even if it’s what the public wants, should they sell images of Titanians murdering each other? As previously established, I am a Joan D. Vinge fan. Set on a very pre-space probe Titan, this story is proof that no matter how awesome fictional characters’ space programs may seem to us, the characters will always be dissatisfied with them. Bell discusses Michael Ovenden and Tom Van Flandern’s proposal that certain peculiarities in Solar System dynamics were due to a Saturn-sized planet between Mars and Jupiter that subsequently exploded. Well, it’s not really Astounding/Analog without a certain level of wing-nuttery non-consensus science. I don’t immediately see a mechanism by which a Saturn-sized planet could explode. Planets are harder to blow up than crappy space-opera movies suggest. Disrupting the Earth, for example, would take about a week’s worth of the Sun’s entire output. The author speculates that asymmetric crusts on many worlds (including Earth) are due to the fifth world going kerblooey. This suggests unfamiliarity with continental drift. Surely that theory was well established by this time? Why is a homicidal loathing of women sweeping the world? Tiptree is never a comfort read but reading this just now, weeks after a so-called incel went on a rampage in Toronto, is particularly disquieting. A short biography of Bell. A murder trial turns on the Grandfather’s Ax paradox: is a person transformed by medical procedures still the same person? Are they a person at all? I don’t in a million years buy the logic behind the “not a person” case but really, it’s an American court so the true question is who has more money: defence or prosecution? A listing of fandom conventions, none of which particularly stand out. Humanity’s first community on the Moon discovers the hard way that one cannot simply ignore the human factors in space. Hey! Meta! I wonder if this was commissioned to go with the editorial. A gigantic intelligent being spawns copies of itself to explore its vast world, only to discover even a vast world has its limits. Tellure’s body of work appears to be small. ISFDB lists only five pieces by her and provides no biographic details. The Encyclopedia of Science Fiction does not mention her at all. This odd story and its sequel have stuck with me for decades and I wish there was more of her material to hunt down. One instalment of a novel later published as Dying of the Light. It is reviewed here. Guest book reviewer Dorman (who by this time had left writing prose to focus on poetry) reviews John Crowley’s Beasts, George Zebrowski’s anthology Tomorrow Today, and Barry N. Malzberg’s Down Here in the Dream Quarters. I have read none of them. Pity Dorman didn’t select three books by women to go with the issue’s theme. Ah, well. I don’t know that she was given a choice. Letters of comment from Robert Levin (promoting Loglan as the logical language of tomorrow! 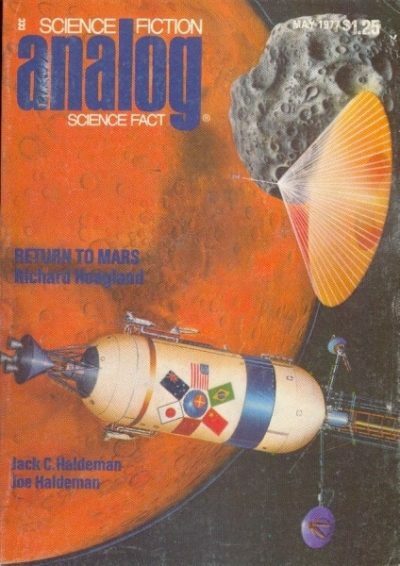 ), Chauncey Uphoff (alerting Analog to the possibility that the first English language discussion of solar sails may have been an essay in Astounding, as Analog was called in the old days), Joseph T. Major (lamenting the lack of plausible funding sources, private or public, for space development), Timothy Stocks (raking another letter writer over the coals for using thinly veiled racist humour), Thomas P. Carey (Proxmire rant) and Janet S. Haffley (free will versus heredity). Bit of a shame they didn’t focus on letters from women, but Analog may not have received all that many letters from women in any given month. Uphoff may have been inspired to write when he did by the science piece in the previous issue. I assume that is the Joseph T. Major, of Heinlein’s Children: The Juveniles and other works. Also included: interior artwork by John Schoenherr, interior artwork by Michael Gilbert, interior artwork by Janet Aulisio, interior artwork by George Schelling, interior artwork by Rick Sternbach, and interior artwork by Vincent Di Fate. What is Janet Aulisio up to these days? I don’t see anything from her more recent than 2003, but the ISFDB does not list a death date, which makes me hopeful that she’s still alive. Including cover and interior art, and counting the book review as a single essay, there are twenty-seven pieces in this issue, of which fourteen are by men. It seems to me perhaps this is just a bit short of the goal for which a Woman’s Issue should aim. Analog, June 1977 came out forty-one years ago and is almost certainly no longer available from your local news agent (were you still to have one). 1: Granted “more women’s stories than John W. Campbell, Jr. would have bought” is still only 17% of the total. Augh. No, that is my job. Note that there are actually three sequels to "Lord of All it Surveys". "Skysinger" (Analog August 1977), "Green Eyed Lady, Laughing Lady" (Analog March 1, 1982) and "Low Midnight" (Analog May 1984). The gigantic - planet sized? - being concept reminds me slightly of James White's novel "Major Operation" (1971) - involving the Sector General space hospital - in which a single living land mass generates psychically controlled drones that operate on a less ridiculous scale. But I don't want to describe in detail elements that are White's plot surprises.